If you are a cat lover, then you are sure to fall in love this slot game. The Meow Money Slots game has a unique feline theme and will give you a nice warm feeling. Get to play this perfect slot game at Casino UK, a leading online casino UK. Say Hello Kitty With Meow Money Slots Game At Online Casino UK- Login Now! Undoubtedly, cats are super cute with their adorable little faces and innocently mischievous antics. This video slot game from Nektan is overloaded with cuteness with the help of its cat theme and deployed for your endless entertainment. 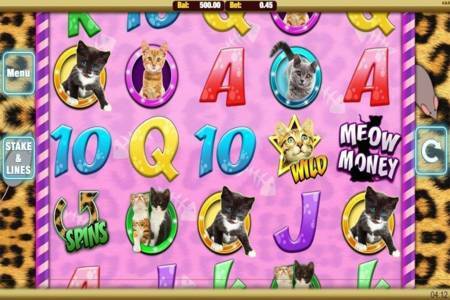 Upon this 5 reel video slot game, you will find a gang of cute little-pawed cats and kittens. There is a ginger tabby cat, black and white cat, lovely little grey haired kitty and another symbol which shows two cats in one. So, if you are a cat person, then this is definitely a game for you to try. The photographic visuals and the leopard print screen design will make you fall in love with its interface. The whole game is very colourful with a wonderful background music, that lends the game a fun and bouncy feel. If you are looking for a well-reputed online casino UK, then Casino UK is the place to be. The hassle-free gaming environment and attractive bonuses at Casino UK make it a top online casino UK. Casino UK is home to several popular casino games powered by top-of-the-line software developers like IGT, Nektan, NextGen and more. One such popular game is Nektan’s Meow Money Slots. The makers of this game are well-known for their optimised design, mainly targeted for mobile play. So, you are sure to find this slot game appealing and very user-friendly, without much clutter. The game is easy to follow with its streamlined action. Casino UK is mobile friendly and accepts payments made through mobile as well. Make a deposit with the mobile phone and get the amount automatically deducted from your phone credit. Whether you use a prepaid or postpaid subscription, it is real easy to make a mobile phone deposit. Casino UK has some of the greatest promotions exclusively lined up for you. We like to welcome all new players with a fantastic welcome bonus – no deposit bonus of £5 and 100% match up to your first deposit up to £500 along with 50 free spins on selected slots game. This means that you can play the Meow Money Slots game for free without any deposit required. Simply sign up with us and get rewarded with free £5 in your account to get started with your free play. Let your journey begin with our esteemed online casino UK. Make free bets on Meow Money, try out the game for yourself without risking anything. If you win, keep the prize money for free and withdraw them after you fulfil the wagering requirements. Enjoy a round of free spins on Meow Money Slots game. When you see the scatter symbol of 3 or more Spin Symbols in your reels, this bonus round gets triggered. Meow Money Slots is a 5 reel slot game that comes with 9 pay lines. The big highlight of this game is the top jackpot round worth 2500x multiplier. You will be able to trigger this jackpot when 5 matching Meow Money logo symbols appear on the reel. Multiply your bet by 2500x times, when you hit these symbols. Place a bet for 1 coin and earn the chance to win up to 2500 coins in one shot. Also, look ours for the wildcat symbol that can substitute for other symbols except for the free spin scatter. The double cat symbol qualifies for a 1000x multiplier, the grey cat 750x, black and white cat 500x and the ginger tabby cat rewards 300x. The other symbols are standard symbols that offer a smaller range of payouts. You might find several slot machines that take on interesting themes, but Meow Money Slots game is simply based on cats. Whether you are a cat lover or not, you are sure to find this game cute. Get set to be hypnotised by the spinning felines!